I’d not heard of these before but apparently they are quite popular. They’re called “Carnivals” – a blog where someone decides to gather together a whole lot of information from the web on one subject, aggregating it conveniently into one place. Beatles Blog is featured on Jim’s first edition, as is the very fine WogBlog. Jim says the first 25 people to register on the site will win a free Beatles memorabilia item. 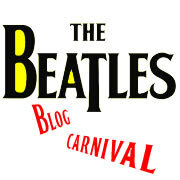 There will be a new Beatles Carnival on the site on the first Monday of each month. This entry was posted in Beatles, Beatles Collecting, Beatles Music and tagged Beatles, Beatles Carnival, Beatles Collecting, Music by beatlesblogger. Bookmark the permalink. This is a very nice blog. I follow this blog (and Jim’s blog carnival also). Thank you for all of the great information. Oh my gawsh, I LOVE this! Read the second edition that’s online now.